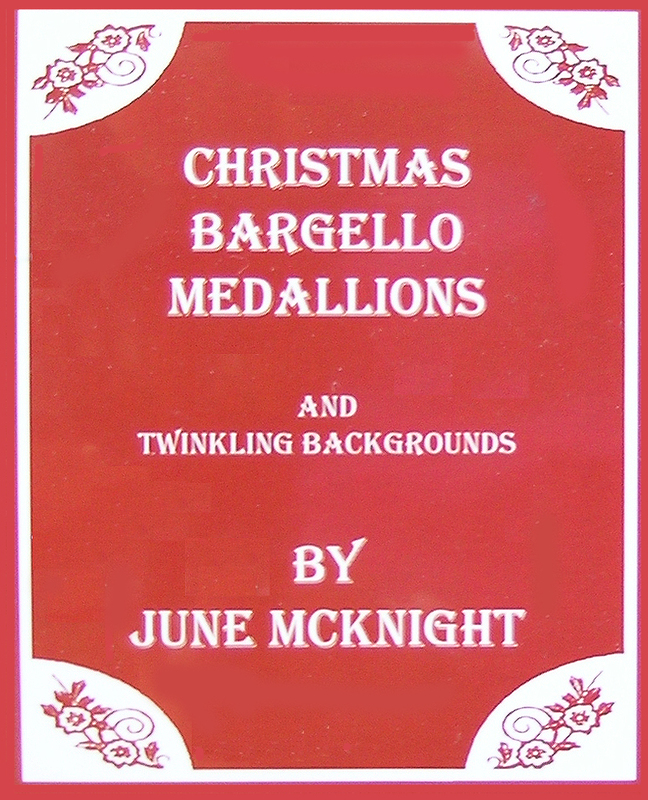 CHRISTMAS BARGELLO MEDALLIONS & TWINKLING BACKGROUNDS, June McKnight, self-published, 2008. This little book is designed to give you ideas to use Bargello as the focal point for quick and easy ornaments. 24 different Bargello medallions, including some Four-way Bargello, are presented on two-page spreads. The left page shows a stitched sample of the medallion, often with charms or buttons. The right page has the graph, just enough to show you how the pattern is stitched. Sometimes this is only the outline, and sometimes this includes some of the fill pattern. You select your own colors and threads. A medallion is stitched to be the focal point of an ornament. They are so fast to stitch several of them can be stitched in an evening. But then what do you do? That’s where the second part of the book comes in. 18 open backgrounds are presented in the same two-page format. They are all open stitches, which will allow the canvas to show through. All of them are pictured stitched in metallic gold on black canvas. This really shows off the patterns. Some are open versions of familiar stitches, such as St. George and St. Andrew (Alternating Cross), while some are Tent or Brick Stitch patterns. All of them would make charming backgrounds, not only for the medallions. This section opens with a page of helpful hints for stitching the background so the threads won’t show through. This is a common problem with open backgrounds and June’s advice is worthwhile. Coming away from the book, there are many things I really liked about it. I thought the idea was good, I liked the patterns and I found the backgrounds were useful for more than just Bargello ornaments, but ultimately I was unsatisfied with it. My problem is largely the price. While the format is small enough to fit in my stitching bag with no trouble, the book is printed on very heavy glossy paper and is spiral bound. Looking at the price and the total number of stitches and medallions, the cost per item works out to be more than $0.70. I just can’t help feeling this is too much to be paying, in these tough times, for a needlepoint book, now matter how many ornaments I make. I couldn’t agree more with you about June McKnight’s latest bargello book. Due to the high cost, it is unlikely that I will purchase it. I knew it was coming out and was really looking forward to getting it, but I just can’t justify the price. I own several of her other books and enjoy the handy format she uses. Love your website! So, how much is the book? I would love to see it. Sounds really neat. I, too, love your blog and welcome all the information. Thanks for sharing. You can find it at needlework shops. I think my copy was over $35, but I’m not sure.